We all have multiple traits in life and one of the most important traits is to have a trait of being grateful for everything we possess. For being grateful, it is really important to express your thanks. We are here today with the most creative and amazing ways to say thank you and to show appreciation. Saying Thank You to someone shows that the person did something for you or gave your something. It is an act of making the person feel appreciated for the things he/she did for you which will make them happy. It actually makes the person feel that what they gave you or did for you is something which made you happy. This kind of behavior helps in improving relationships and friendships. Saying Thank You is a moment of happiness for the person who did something special for you, though it is a brief moment, yet it does create curls of positive energy within them. 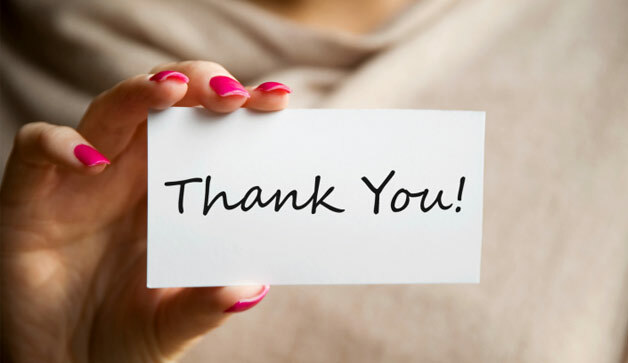 When someone does something for you or helps you in some way, just express your gratitude by audibly saying Thank You. Say Thank You to all those people who serves you or does a favor for you. It has been often seen that saying Thank You with a smile or a nod is truly enough to show appreciation, but sometimes you need to do something more. Yes, you can bring creativity out of you. There are different ways to say Thank You and to show appreciation. We do hope that you find all the ways here, yet we would like to have something more from you. You can express your gratitude and show appreciation by taking the person over a cup of coffee or for lunch or dinner. You can say thanks to your lover or spouse by taking them for a show. #2 Give them a Smile! You can smile or give a nod to a person making him or her feel special and happy for what they did for you. You can buy the person a present which displays as a token of love or appreciation to the person who did something special for you. It will make the person feel appreciated even if they don’t expect anything in return from you. You can buy a book, flowers, pen or a chocolate, or anything. You can show your appreciation by regularly visiting the person or mailing them with forward messages. You can simply be in touch in with on the regular basis. Or you can even send the person a thank-you mail or can buy a gift online. If you are the owner of a business, then you can show your appreciation to your employees by giving them small presents. This is a simple way to express your gratitude which is something apart from money or bonus. You can even buy your employees a ticket of a movie or you can arrange a small get-together. #6 Give something your parents a surprise! If you drive your dad’s car who is an automobile freak, then you can express gratitude by getting his car wash once in a while or can get it a free service voucher. If someone did something special for you, then you can send them an appreciation mail saying thank you for what they did for you or gave you. #8 Say Thanks on Facebook! You can say Thank You to people through Facebook. You can send people digital cards online. There are numerous services available online. #10 Gift them a Baked Cake! If you know how to bake a cake, then you can bake one and gift it to the person to whom you want to thank you. You can even invite the person to a lunch or dinner at your home and cook a special meal with their favorite dishes. #12 Ask them for a Return! You can ask a person that how you can help them in return. These are just 12 ways to say Thank you and to show appreciation to the people who did something special for you or gave you something. You can even think about some more ways. And yes, we would like to hear from your side as well. "Thank You" and ‘Please’ are the two English words which are really important to feel the true essence of relationships and friendships. Even if we notice that practically, these are the two words which are commonly used in every conversation. Do you know that even your few kind words or your nod or a smile is enough for thanking people and showing them your appreciation? YES. Saying just two words, THANK YOU to the person helps in creating a positive and good atmosphere which makes the world a happier place.